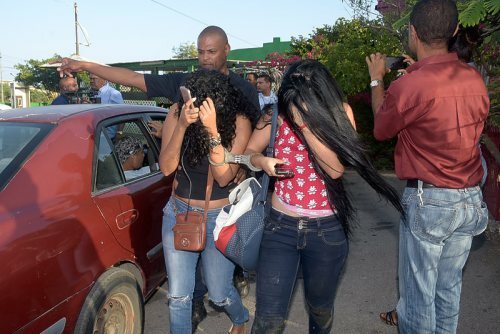 WILLEMSTAD - The multi-disciplinary team led by the Inspection Section of Curaçao’s Ministry of Economic Development during a control at the Ñaña snack bar detained 17 Venezuelan so-called “trago girls” who tried to run away when the officials arrived. The women were working without an employment permit to get male customers to spend more on drinks. It turned out the establishment lacked a liquor licence too and rented rooms in the back for prostitution, so it was closed. Clients could buy the ladies a small cup of Tip Top syrup diluted with water for five Antillean guilders (the price of a whole bottle in the store), of which they then got four in the form of a chip to be collected at the end of the shift. The team also went to Sabor Uniko Restaurant on Metselaarsweg, which did not have the proper licence either and was illegally renting rooms there to Venezuelans. The dirty and unhygienic place has been shut down as well.